Technically speaking, a mitzvah is a commandment, a duty born of religious obligation. But look more deeply, and it can be defined as an act that reaches into the cosmos to bring boundless harmony and light. 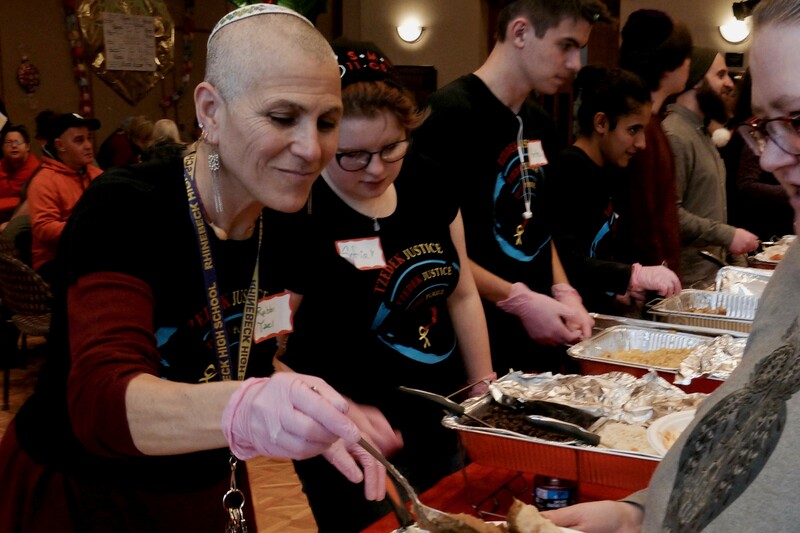 Mitzvah and Christmas spirit became one this December 25th, when Congregation Emanuel of the Hudson Valley, partnering with Family of Woodstock, invited all those without festive food and family on Christmas to its 1st Annual Christmas Feast. About 125 guests—most of them food-insecure, elderly, and/or people with disabilities—had their fill of four entrees (turkey with stuffing and gravy, smoked salmon, brisket, and rice and beans,) as well as multiple sides (including sweet potatoes, corn, green beans, coleslaw, and apple sauce) desserts (cookies, cakes, pies, and more)—almost all homemade by volunteers or donated by local businesses. 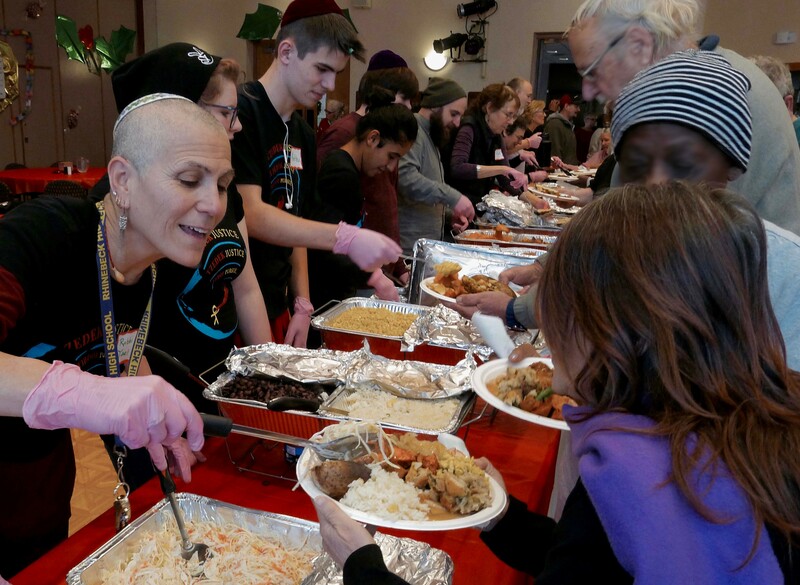 Feast co-organizer and Rifton resident Joy Weinberg conceived the idea after she and her wife Elissa Bromberg volunteered at the Family of Woodstock (FOW) 2016 Christmas Day Dinner in Woodstock and saw how the abundant food, along with uptempo music and celebratory cheer, connected volunteers and visitors alike. “There’s a great need for such a warm and bountiful Christmas Feast in Kingston,” Joy thought. In time the larger congregational community was rallying around the event. Members cooked turkeys and pumpkin, butternut squash and brownies, Christmas cookies and cherry pies. 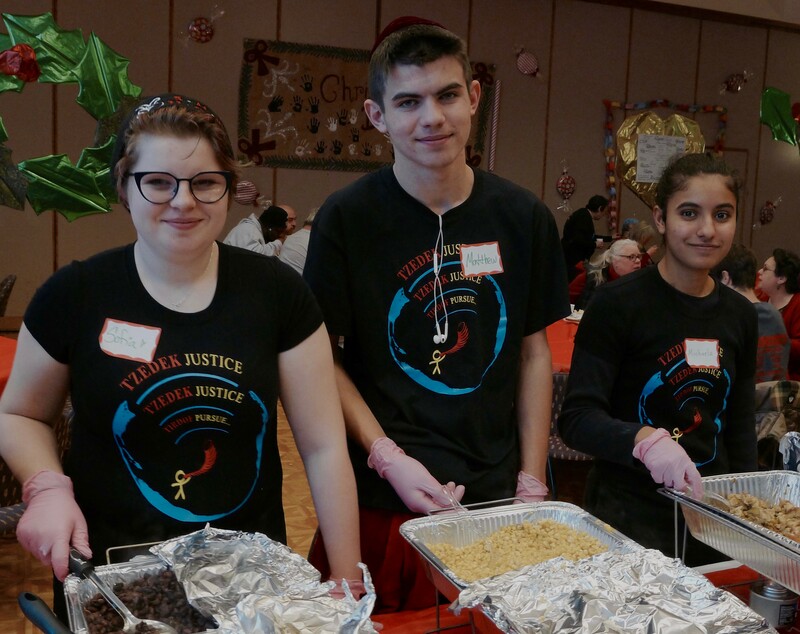 Family of Woodstock introduced the core team to Steve, Jeanne, and Kelly Niemis, experienced food preparers for Family events, who helped with food logistics and made turkeys, smoked salmon, and brisket too. The wife of the synagogue’s custodian made three platters of rice and beans. The synagogue’s administrator, who celebrates Christmas, made apple crisp. 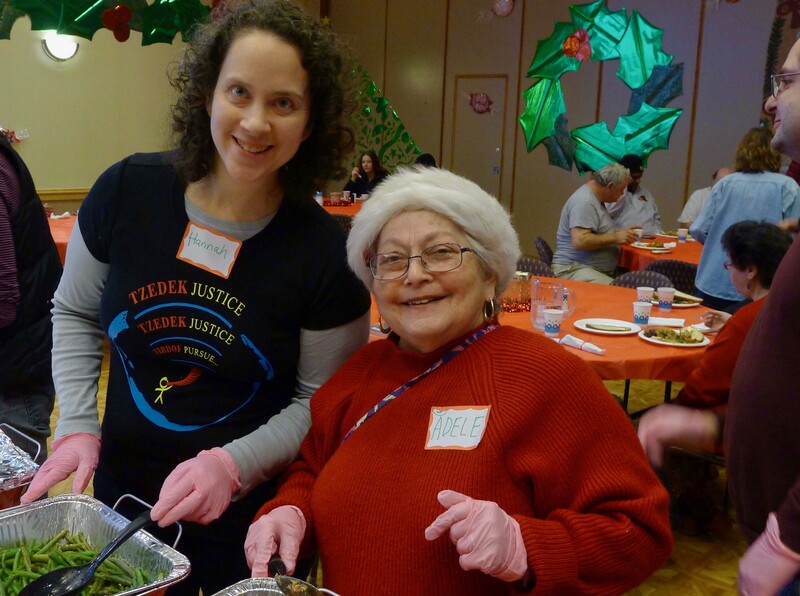 All in all some 70 volunteers, members and not, both Jews and Christians, joined together to do everything from carve turkeys to wrap presents to converse with guests to offer those without cars free feast shuttle services. On Christmas, almost all guests stayed for the full 12pm – 3pm-event, grinning and moving to the beat of three local bands: Cantor Bob and the HV Jubilee (Americana classics with a groove, led by the synagogue’s cantor, Bob Cohen), The Gold Hope Duo (rockabilly), and Saints of Swing featuring Miss Renee Bailey (swing). When the bands changed at the top of each hour, door prizes (such as earrings and gift cards to the Dollar Tree and Wallmart) were announced. Midway through the feast, Santa Claus arrived in the synagogue, giving out gifts to all the children. One man was there with his five-year-old daughter and three-year-old son. He’s a single father, he said. The children’s mother is a drug addict. The dog tags he wore had belonged to his brother, a veteran who committed suicide last year. Another man said programs for the needy in Kingston were “vital.” He himself was anxious about his recent retirement because of the reduction in income. A younger man had recently been released from jail. He is now homeless. Counselor John Lowe brought four residents from Gateway Industries who had nowhere else to go on Christmas Day. A half hour before closing time, feast leaders brought out takeout containers and encouraged guests to fill them with food. Volunteers also packed bread and fresh fruit into other take out containers, handed out pint containers of milk, and placed all the edibles into shopping bags for the departing guests. People left with armloads of presents, food, and smiles. Thu., April 18, 7:30-10:30 p.m.